I often wondered why Kerala was known to be God’s Own Country, surely the rest of the world did not belong to the Devil. Did the people of Kerala generously bribe God or was God simply partial after a heart Kerala meal. When you travel around Kerala experiencing its many facets, you are reminded that it is the people who retained it with care through the centuries in reverence to the divine and God was not really partial. When I was planning my trip to Kochi, I included an evening of art and culture. After some research I zeroed in on Greenix Cultural Centre in Fort Kochi. I purchased the combination ticket for Rs 500/- for all the dance forms which also included the permission to click pictures during the performance. The program is for about 90 minutes starting around 6pm. If you wish you can arrive early and watch the Kathakali artiste don the elaborate makeup. Experiencing the dance program from the sensuous and gentle Mohiniyattam to the martial art form Kalaripayattu or the Kathakali, was a tryst with history, turning the pages with every movement, as the performers glided through poses to the rhythmic beats and background narration of love, passion and chivalry. 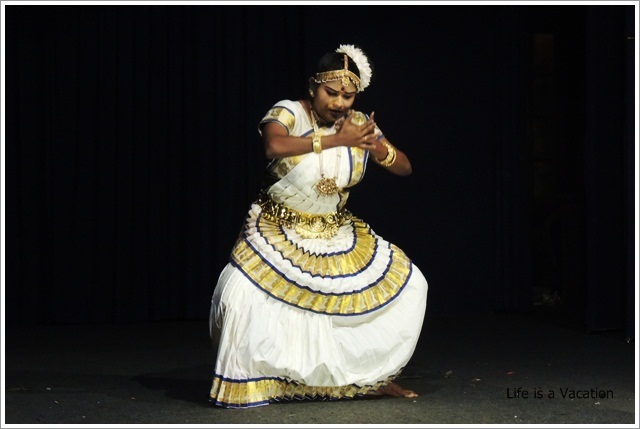 True to its name, Mohiniyattam is characterized by gentle movements and perhaps the only dance form performed by women only. It is the dance of the enchantress (mohini), stressing on enticing eye movements and mudras (hand and finger movements) but performed with deep devotion to god. The name was derived from “Mohini” – Lord Vishnu incarnate to entice the asuras(demons) away from the nectar of immortality. The dancer dressed in “Kasavu” – white saree with a bright golden border swayed gracefully, flowing from one pose to another and the expressive eyes communicated with the audience. 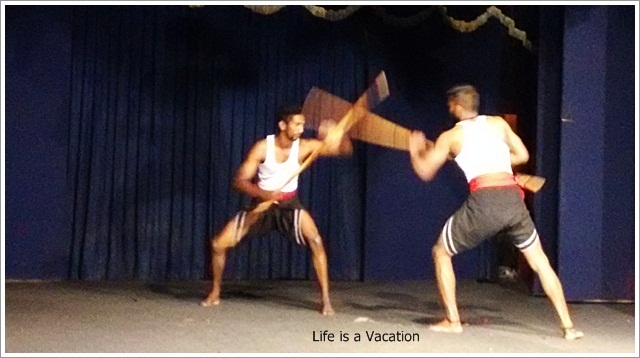 Kalaripayattu is often termed as a martial art form given the demonstrated kicks and punches, and use of sticks and shields but if you look beyond, it is yoga in motion, exploring the limits of the body, discovering the joys of rigorous movement that can heal and regenerate and keep the body agile. The dancers moved from one end of the stage to another in lightning speed spinning the sticks in hand with amazing dexterity. It traces its origins to Agastya Muni and was practiced from as early as 2nd century BC by mighty mythological Bheem in Mahabharata to later day royal princes and more recently silver screen heroes. 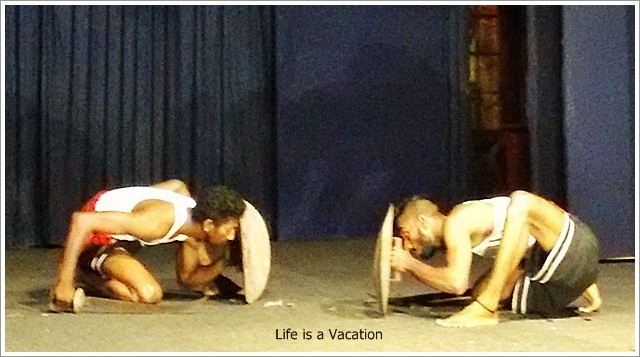 The Kathakali performance started with the dancer demonstrating the Navarasams or the 9 dimensions of human feelings through facial expressions. He was accompanied by a singer who was reciting verses in Manipravalam which I am told is a mix of colloquial Malayalam and Sanskrit to the tune of carnatic music. Soon the artiste who we had watched earlier applying makeup appeared on stage wearing an ornate head gear and a billowing skirt. They were enacting an event from Ramayana related to Surpanakha (the demon princess). The night long Kathakali performances of yester years have now been transformed to short performances to keep with the taste of the evolving audience. I missed the Theyyam performance since the artiste was out that evening. Theyyam is a bit rustic, performed in the villages of Northern Kerala, with makeup and attire having similarity to Kathakali. 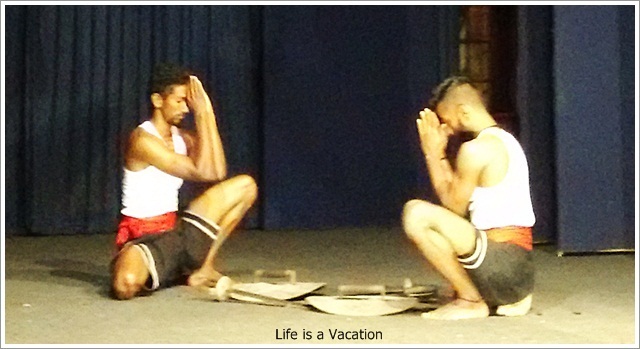 While travelling through Kerala, spending an evening watching dance performances may be an ideal way to connect to the soul of the land. If you are in Kochi, drop into Greenix in Calvathy Road. 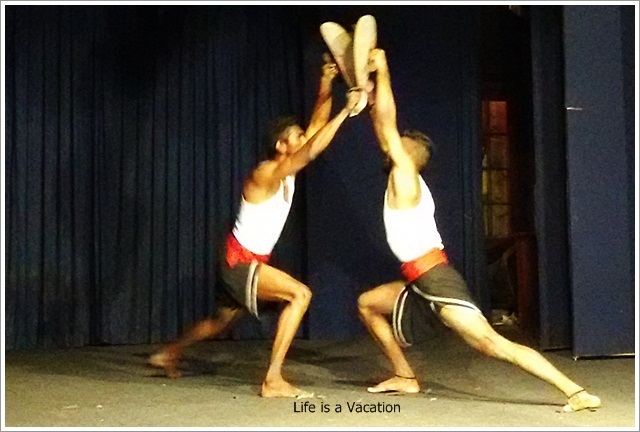 There is a performance every evening between 6pm and 7.30pm. If you arrive early, you can watch the artiste apply the elaborate Kathakali makeup which is an art by itself. At the end of the performance, you can click pictures with the artistes on stage. Make sure to take off your shoes while stepping on stage since these dance forms have connection to temples and mythology and are treated as an act of devotion. My love always with Kerala! That must have been interesting. Great to know you found a place to watch all these art forms. Did you get to watch the Kathakali make up? It is fascinating, right? !